Of course there are formal ways of learning a language. But how about a simple method which works right within Office and helps you learn the language? But Word has another elegant feature which is very handy for learning a new language. 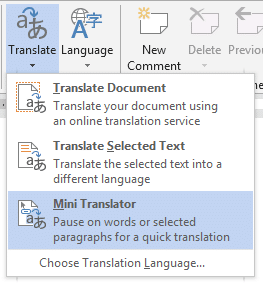 Choose the Mini Translator option and click Ok.
but if you are interested in it, just move the mouse cursor over it… then it is fully visible. This is what I got in Chinese.. it even shows the acronym NEW! Please note that you DO NOT have to click inside the word to translate it. Just move the mouse cursor over it and then stay there for a second. 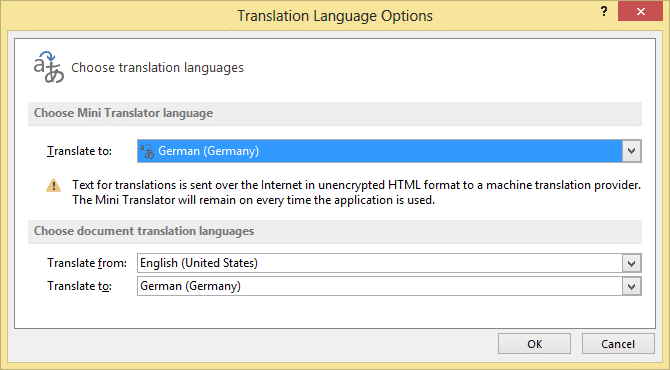 Of course, you can always select a phrase and then see the tooltip to view the translation. This is very powerful and useful. Another great feature of this is the play button… it speaks the highlighted word in the base language (NOT the translated language). A great way to learn proper pronunciation on the go… very useful for everyone who wants to improve their diction and public speaking skills. Especially useful if your pronunciation is heavily influenced by your native language and foreigners find it difficult to understand you. Usually mouse hover event is used to show tooltips on UI elements. Here is a rare but brilliant usage of the same concept in the main document context. It is a perfect implementation because translation can be potentially required at any item. Base granularity is a WORD under current mouse context. If there is a selection below the cursor context, the entire selection is translated.